President AbdelFattah al-Sisi Wednesday pledged Egypt’s commitment to uncover murderers of Giulio Regeni, a 28-year old doctoral student found killed by the roadside in Cairo February 2016 after being last seen on January 25, the anniversary of Egypt’s 2011 uprising. The Egyptian president expressed “a strong will to reveal the perpetrators and bring them to justice,” said presidential spokesman Bassam Radi in a statement following a meeting between al-Sisi and Italian deputy Prime Minister Luigi Di Maio. The meeting is the highest level encounter between the two countries over two years after Regeni, who was doing a research on Egyptian trade unions, went missing on January 25, the anniversary of the revolution. The streets of Cairo were then swarming with security forces as authorities banned all protests. Regeni was last spotted at Cairo metro station. He would be found dead few days later on February 3, along a highway, north of Cairo. His body half naked was showing signs of bruise that investigators believed were results of torture. The student’s parents accused Egyptian security authorities of being involved in the killing of the researcher. The authorities have denied any wrongdoing. 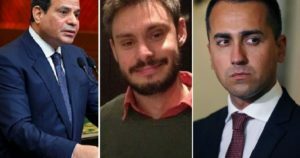 Regeni’s death strained relations between the two countries as Rome in 2016 recalled its ambassador over Cairo’s failure to cooperate in the investigation. Italy restored ties last year with a new envoy. The joint investigating team working to uncover the cause of Regeni’s death will be meeting again soon, Italian deputy Prime Minister Luigi Di Maio was quoted as saying by Reuters. The joint team has been working to retrieve surveillance footage from the Cairo subway system as part of a joint investigation. In June, the team complained that footage from the system on the day of Regeni’s disappearance does not include images of him, reports say. Posted by Khalid Al Mouahidi on August 30, 2018. Filed under Zoom. You can follow any responses to this entry through the RSS 2.0. Both comments and pings are currently closed.